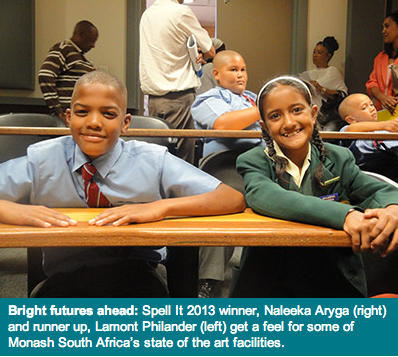 Winner of the 2013 Spell It competition, Grade 5 learner Naleeka Aryga from Mondeor Primary School and runner up, Lamont Philander from Eldocrest Primary, each received a full tertiary education bursary from Monash South Africa. The annual Spell It program, sponsored by Nedbank Capital, kicked off in 2010 as a response to poor literacy levels in underprivileged schools. The winners are awarded bursaries to study any of the courses offered by Monash South Africa, provided that their grade 12 results meet the entry requirements. 2013 winner, Naleeka Aryga expressed her excitement about winning a bursary to study at Monash South Africa after matric: “I am very happy about winning the competition so that one day, I can be able to follow my dreams”. Runner up, Lamont Philander, who dreams of pursuing a career in business or science, is grateful for the award and says it feels good to know that his parents don’t have to worry about paying for his future studies. The Spell It competition has grown, with the support of the Department of Education, from 18 schools and around 1,800 learners in 2010 to approximately 9,000 participants in 2013. It runs in conjunction with a coaching program in basic spelling, reading and literacy in previously disadvantaged school districts. “As an institution of higher learning, Monash South Africa is proud to be associated with any project that allows learners to reach their full potential and overcome gaps in the educational process. These types of endeavours help to pave the way for future African leaders,” says Professor Dina Burger, Deputy Pro Vice Chancellor at Monash South Africa. The 2014 Spell It competition will take place in September with learners from 200 schools already hard at work reciting thousands of words. Article source: Monash South Africa. To view their profile on SAstudy, click here.